San Diego Marriage Based Green Card Interview Questions Lawyer by Habib Hasbini, Attorney at Law. As a part of the Green Card process, all adjustment of status applicants filing as the spouse of a U.S. Citizen or a Lawful Permanent Resident (LPR) need to, along with their spouse, attend a marriage interview. The Green Card marriage interview is generally conducted at a USCIS district office. The purpose of the interview is to enable the interviewing USCIS officer to verify that the marriage to a U.S. citizen or LPR is bona fide and genuine and is not a marriage entered into for the sole purpose of gaining any immigration benefits. 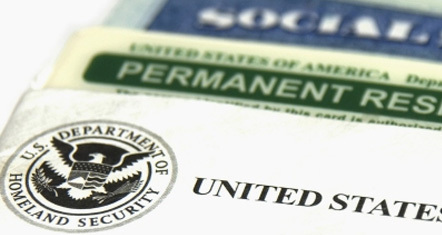 At the USCIS office the applicant and U.S. citizen spouse may be interviewed together, or may be questioned separately. Sometimes the interview may also be video-taped. The purpose of the USCIS marriage interview is to identify sham and/or fraudulent marriage arrangements that are entered into for the purpose of immigration benefits. There is no specific list of Green Card interview questions that you may be asked. The flow of the interview is generally dependent on the convincing responses provided by you to the various questions posed by the officials. The Green Card marriage interview is a major aspect in the inspection process, and should not be presumed as simple and easy or as a mere formality. We have put together some common marriage based Green Card interview questions asked by USCIS officers and tips on how to better prepare for the marriage based Green Card interview. Listed below are some sample marriage based Green Card interview questions that you may be asked, and some helpful tips to successfully navigate your marriage interview. Reflect on the history of your relationship. Be prepared to portray your journey from initial meeting to marriage. First date, subsequent meetings, important events, happy moments, sad moments, disagreements, times spent together, times spent with each other?s family and friends, special gifts, proposal, acceptance, sharing the news with family and friends, etc. Who introduced you to your spouse? When and where did you meet the first time? Could you describe the first meeting? Be prepared to answer questions about the wedding ceremony, reception, guests, interesting or embarrassing events, if any, that happened during the ceremony or reception, what was served, how guests were entertained, did the wedding ceremony have a theme, who wrote the vows, who purchased the rings – how and where, who paid for the ceremony, honeymoon plans, etc. What is the date of your marriage? What day of the week did you get married? Be prepared to answer questions relating to your present and past residences where you have lived together, including furniture and appliances, automobiles you have or had, type of residence, how big or small, number of rooms, neighbors, and visitors. Also be prepared to answer questions about job details, work schedules and working conditions, earnings, joint-spending, investments, tax filings, joint bank accounts, financial dealings, mortgages, future plans etc. If the USCIS officer suspects fraud he or she will go into much more detail. If this is the case you may also be asked to draw a sketch of a particular room or portion of your residence. Sometimes you may also be asked to show your house keys and tell what keys go to each door. Describe the place where you lived right after the marriage? Number of bedrooms and bathrooms; furnishings; color of walls, floor covering, appliances, etc; type of air conditioning (window or central), heating (gas or electrical), etc; number of telephones, TV sets etc. How long have you been staying at the current address? Be prepared to answer questions about each others? general habits, lifestyle, preferences, daily routines, schedules, household chores, favorite pastimes ? individual and together, holidays spent together, specific rituals that you follow, shopping habits, food habits, sleeping habits, religious routines, etc. Do you set up the alarm clock to get up in the morning? Be prepared to answers questions about each other?s relatives, friends, family, work place, family gatherings, festival celebrations, family holidays, anniversaries, dates and events of importance, etc. Be prepared to answer especially about your children, your spouse?s children from previous marriage, parents, siblings, other close relatives, if any, etc. What is your spouse?s full name? What is your spouse?s date of birth? What is the city and country of your spouse?s birth? Be prepared to answer questions about how you got to the interview venue, how your day had progressed so far, what happened in the immediately preceding days, plans for the rest of day, immediate future plans etc. Did you or your spouse go to work yesterday? If so, at what time did you and/or spouse leave the house and return? Did you eat dinner together last night? What did you have? The Green Card marriage interview is a major aspect in the inspection process before being granted a green card through marriage, and keeping in mind this often-abused route for gaining immigrant status, the officials do not make it an effortless process. Immigration officials may also search social networking sites such as Facebook and MySpace to investigate your intentions. If a USCIS officer suspects any fraud they may investigate your place of residence and look closely at photographs you supply to determine if they have been altered. It is incumbent on you to prove that your marriage is not solely for immigration benefits. The Green Card Marriage Interview should not be presumed as simple and easy, or as a mere formality. Though the marriage may be bona fide, there is every possibility that the interview may become a grueling and painful event. The Green Card interview questions asked are designed to determine how well you know your spouse and that you have a bona fide marriage. You and your spouse should spend some time reviewing your entire lives together prior to attending the immigration interview. Even married couples living together for many years may have difficulties remembering all of the facts of their relationship. It is therefore advisable that you and your spouse prepare thoroughly for the interview to limit the stress and anxiety generally associated with a Green Card marriage interview. Finally, take the original documents with you of any document you submitted with your adjustment application.